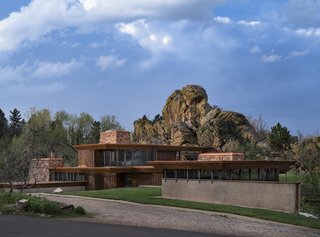 Embedded into a dramatic rock outcropping, this midcentury-modern masterpiece is one of the most recognizable homes in Boulder. 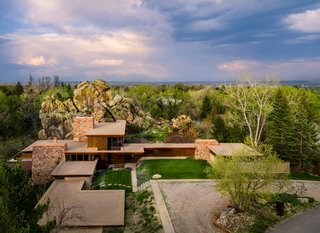 HaertlingFor the second time in 40 years, the spectacular Menkick House by architect Charles Haertling has hit the market and is currently being listed through Boulder Luxury Group for $5,750,000. 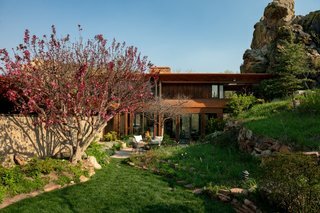 Located just outside city limits in Boulder's exclusive Knollwood neighborhood, this rare 5,780-square-foot property has earned its legendary reputation from the home’s seamless integration with Gyp Rock, a natural rock formation that looms large on the 1.1-acre site. The home enjoys direct access to multiple Open Space trails that lead to hundreds of acres of hiking. 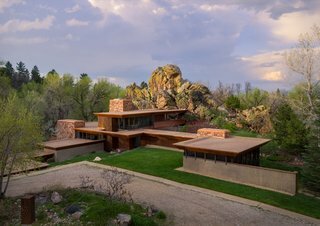 Haertling masterfully matched the four-story home to the boulder’s three peaks and used a natural material palette to reinforce ties with the landscape. 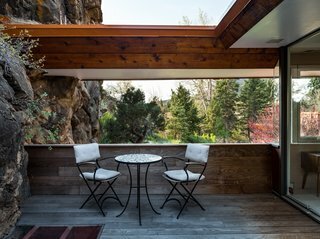 Drawing from Usonian influences, the Menkick House embraces the indoor/outdoor lifestyle with a variety of exterior living spaces, as well as full-height glazed windows and doors. 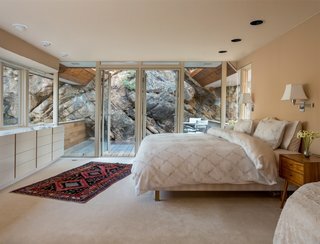 The deck has been recently rebuilt with silver mahogany and is situated for views of Red Rocks and the Flatirons. 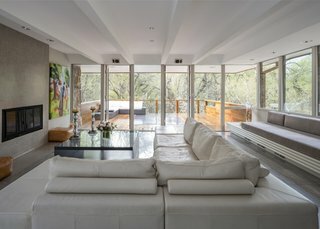 The four-bedroom, five-bath abode has been sensitively updated for contemporary living, while preserving Haertling’s original vision. A small garden tucked away next to the entrance hallway offers a blissful place to dine al fresco. A look at the rear patio gardens. 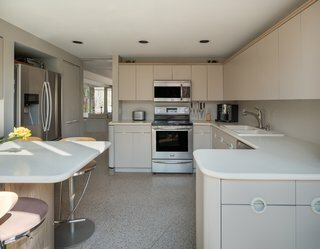 The kitchen enjoys south-facing light and direct access to the garden. 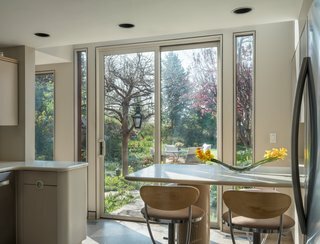 A breakfast nook in the kitchen faces a serene garden. 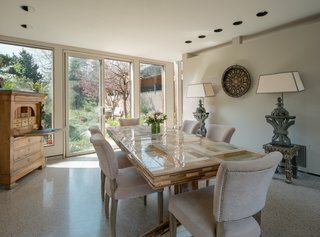 Sliding glass doors fill the dining room with abundant natural light. 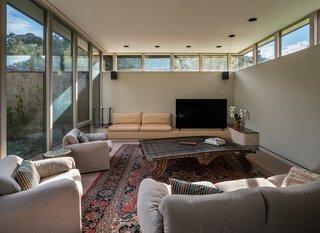 The living room is located in the north wing and has a wood-burning fireplace, built-in sofa, and moveable walls of glass. The light-filled family home is faced with southern exposure glass as well as clerestory windows on the west and north sides of the property. 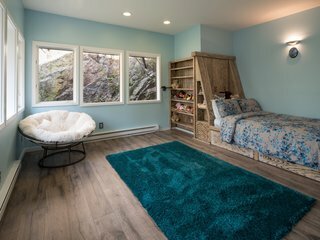 The northeast bedroom is built into Gyp Rock and comes with a handmade, white-oak built-in bed, as well as a private entrance to a small deck. 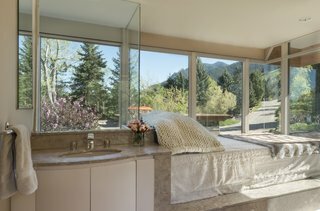 The master bathroom offers unobstructed views of the Flatirons. 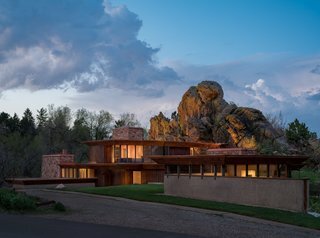 The residence’s three stone structures echo the varying heights of Gyp Rock’s three peaks. A look at the stunning property at dusk. 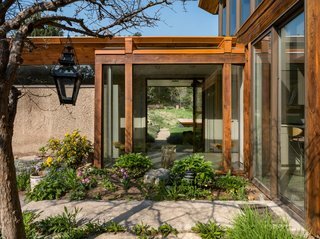 165 Green Rock Drive, Boulder, Colorado is now being listed by Boulder Luxury Group for $5,750,000. See the full listing here.